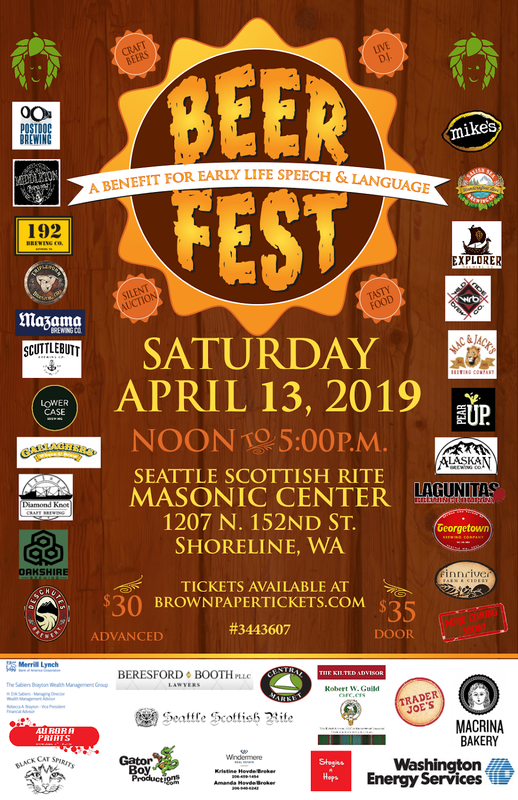 Early Life Speech and Language, a local non-profit providing speech and language therapy for kids ages 2-7, at no cost to the families, hosts its 7th annual Beer Fest Fundraiser in the Seattle Scottish Rite Masonic Center on Saturday April 13, 2019 from noon to 5pm. Director of Development and Communications Susie Beresford said, “This event grows year after year and raises money to support this wonderful service we provide. The community really rallies to make this happen. Early Life Speech and Language was founded by the Scottish Rite Masons more than 30 years ago to fill a void. Speech and language services for children are severely limited. Either the child does not qualify for services, services are too expensive, or services are limited by a billable hour or insurance coverage. Early Life Speech and Language currently has clinics in Bremerton, Seattle, Spokane, Walla Walla, and service areas across the state of Washington. There will be a more expansive list of breweries than ever before, 21 to be exact. Lowercase, Oakshire, Deschutes, Georgetown, Finnriver Cider, Alaskan, Lagunitas, Wild Ride, Mazama, Diamond Knot, Pear Up Cider, Salish Sea, Middleton, Scuttlebutt, Gallagher’s, Explorer, 192, Mac and Jack’s, Mike’s Hard Lemonade, Postdoc, and Triplehorn Brewing. Come learn about Early Life Speech and Language and how they plan to help more kids in Washington state than ever before. 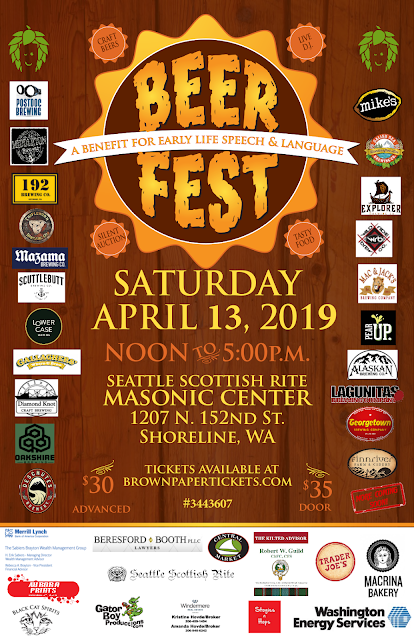 The event wil be held at Seattle Scottish Rite, 1207 N 152nd St, Shoreline 98133 from noon to 5:00pm on Saturday, April 13, 2019. Ticket price: $30 if purchased through this link prior to event, $35 at the door. Ticket includes tastings, commemorative tasting cup, access to the silent auction, bratwurst lunch and raffle tickets. Please reach out to Connor Kelly at ckelly@earlylifespeech.org with any questions. Early Life Speech and Language is a nonprofit 501(c)(3) (Federal tax ID number: 91-1239678) and is registered as a Washington State Charity (#4125).